At one point in time, video surveillance equipment cameras were nothing more than a decoration. With fewer pixels than a modern toy camera and fuzzy frame by frame images, it was said that a blind man with his back turned could provide a better description of a suspect. Over the course of the decades though, video surveillance has made leaps and bounds in technology, accessibility, and relevance, to a point, that they are a must have for anyone looking to secure their home or business. Video surveillance systems provide an array of benefits for business and homeowners alike and continue to improve on the tradition that was established years before. Deterring crimes, recording robberies and thefts, assisting police and giving the world a funny viral video from time to time is all in a day’s work for the modern system. In 1942, in the midst of the second great war, Engineer Walter Bruch installed what would become the first video surveillance system as the Saturn VII rocket launch site in Peenemunde, Germany. This closed-circuit television system allowed security and science staff to monitor any sabotage efforts or mechanical malfunctions for the rocket’s test fires. Building on the first system at the Saturn VII facility, German engineers continued to improve the video surveillance system on the streets of Hamburg. Demonstrated by the Polizei further in Frankfurt and Main, the German pioneered “automatic red-light surveillance” program cemented these systems in police culture. After the successes realized by the Polizei in Germany, the UK, and the US used the 1960’s to further innovate and demonstrate the effectiveness a video surveillance system could have. Used in London to monitor the city center and create a culture of safety, the British would continue to expand their CCTV systems throughout London and the rail system. Across the pond in New York City, metropolitan police forces were starting to notice the success of the Brits and the Germans but weren’t to the point of installing these systems just yet. That would take a disgruntled Sears store manager to kick start. The angry manager was upset about a directive from corporate to purchase, house and care for a guard dog for his Orleans, New York location. Due to thefts and break-ins, company officials wanted the dog put on duty to help deter crime, but refused to provide the store manager with the resources to care for it. After hearing these complaints, Micheal Arnold, the owner of a Cablevision company, pitched the idea of installing surveillance cameras along the main business way instead. 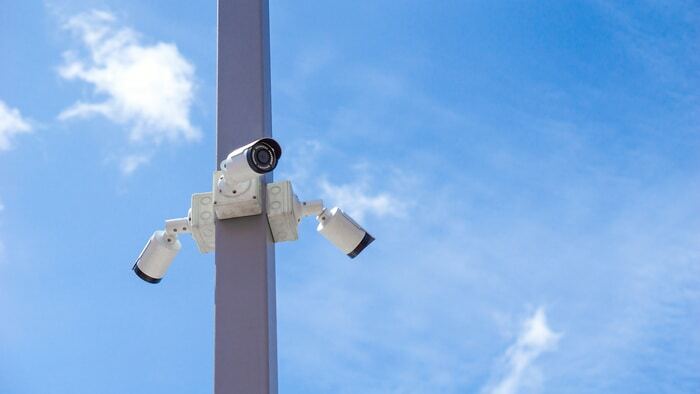 $1.4 million and 8 cameras later, Olean, New York was officially the first US town with a public surveillance system. Within just a year of completion, nearly 160 police chiefs from around the country had visited the small New York town to evaluate their new system. This would lead to public surveillance systems being installed across the country and the years ticked onward. Prior to the invention of the VHS tape, CCTV monitors required constant monitoring if they were to be effective. However, with the ability to record the cameras onto a playable tape introduced in the late ’70s, video surveillance systems could be left to do their work all by themselves. With this innovation, the surveillance camera market exploded with business owners and police organizations around the US installing cameras as fast as they could be produced. From there, VHS would turn to writable discs that had far more storage and the ability to be quickly written over. Along with multiplexing, or the ability to record multiple cameras at once, video surveillance became a standard. While video surveillance had been enjoying success around the globe, one innovation would forever change the industry. The conversion to digital optics and storage vastly improved video quality and records. No longer could a criminal cover his face with a hand and escape identification. Digital camera systems produced crystal clear video that could be rapidly reviewed, easily stored, and sent back and forth from stores to police agencies, news outlets, and social media outlets without as much as a stamp. It’s fair to say that surveillance systems have come further faster than almost any other industry, especially the security sector. And with technology improving on what seems to be a minute by minute basis, it’s hard to even think where they’ll be in the next 10 years.